Sayles’ portrayal of the disgraced slugger, however, was based more on folklore than fact, for the real Joseph Jefferson Jackson was capable of signing his own name as evidenced by a wide array of surviving legal documents executed during his lifetime. Mortgage documents, promissory notes, contracts, real estate agreements, court transcripts and identification documents issued by the state of South Carolina have survived and are the best tangible proof that Jackson could actually sign his name. These genuine documents serve as proof that authentic signatures do exist of the legendary player who was banned from the game and has been denied entry into the Baseball Hall of Fame. Fueled by the legend and the folklore, the value of Jackson-signed items has skyrocketed over the past few decades as evidenced by the sale of a signed 1916 promissory note that recently fetched close to $130,000. But with sales prices of Jackson signatures are setting records, acquiring a Jackson signature still remains a very dangerous proposition for any collector hoping to secure an authentic scrawl of the Greenville native. It all started back in the late 1980’s when real Jackson signatures were virtually non-existent and highly sought after by major collectors like Barry Halper. Halper believed he had a genuine Jackson signature but it was actually a ghost-signed version penned by his wife. It wasn’t until 1989 that Katie Jackson’s signatures were dismissed as secretarial and a year later autograph auctioneer Herman Darvick offered what he claimed was an authentic signature of Jackson allegedly cut from a legal document. The signature looked entirely different than any of the signatures that Mrs. Jackson had sent back to collectors who had written to her husband at their home in Greenville, South Carolina. In 1991 Bill Madden reported on Barry Halper's alleged acquisition of a genuine Joe Jackson signature in a Herman Darvick auction. Halper previously thought a signature executed by Jackson's wife (Katie) was authentic (inset in red). Madden published an image of Jackson's real signature on his drivers license. Halper’s quest to acquire Jackson’s signature in Darvick’s auction was covered on the pages of The Sporting News by his close friend and personal PR-man, Bill Madden. Halper had already boasted to Madden about owning Jackson’s Black Sox jersey from 1919 and his famous “Black Betsy” bat, both of which he said he acquired from Jackson relatives in the mid 1980’s. But Halper had come to the realization he didn’t own an authentic Jackson signature and when Darvick’s appeared he was prepared to pursue it aggressively to fill the hole in his collection. Herman Darvick appears on JSA's website as one of the company "experts" and notes his sale of the "first authentic signature of "Shoeless" Joe Jackson. Herman Darvick has worked as an authenticator for PSA/DNA and is currently listed on the SGC website as a staff member and on the JSA website as one of Jimmy Spence’s experts with his “field of expertise” being “historical” and “political” autographs. The Darvick bio on the JSA site also references the Joe Jackson forgery stating that Darvick handled “the first authentic signature of “Shoeless Joe” Jackson ever sold.” An embarrassing episode for both Darvick and JSA occurred recently when the History Channel’s hit cable-TV show Pawn Stars featured a Darvick-authenticated Jackson autograph signed on a book (the bottom signature in the above illustration). Pawn shop owner Rick Harrison allegedly purchased the book for $13,000 with an LOA from Darvick and was then told by PSA/DNA it was their opinion that the signature was not genuine. Contrary to Herman Darvick's claim, genuine Jackson signatures on his 1949 drivers license (left) and his 1920 White Sox contract (right) were known and publicly displayed before his sale in 1990. 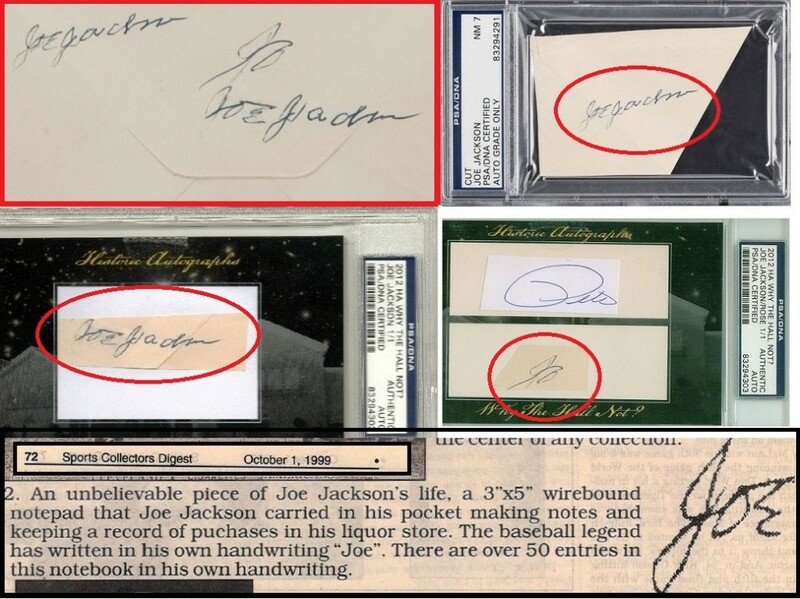 But Darvick’s claim that “collectors had never seen a real Joe Jackson signature before (his)” is entirely false. 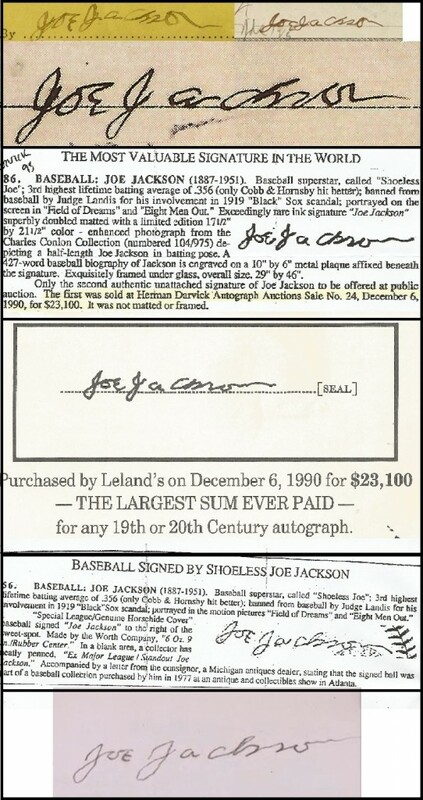 Before Darvick sold his cut to Lelands in December of 1990 there was already an authentic Jackson-signed 1920 contract on public display at the Chicago Historical Society in the fall of 1989. Darvick already knew this as evidenced in Bill Madden’s 1991 article about the Darvick sale which quotes autograph aficionado Clarence Jerabek as having seen Jackson’s authentic signature on that contract and on several legal documents. Jaribeck told Madden, “Through Shoeless Joe’s relatives, I got to see what an actual signature looked like. It’s on a copy of a drivers licence that is signed by both Joe and his wife.” In addition, Jerabek had already published an article about Jackson’s ability to sign his name in Pen and Quill. By 1990, several hobbyists had also seen genuine signed documents owned by Jackson family members and friends including Lester Irwin and Joe Anders. Darvick actually contacted Jerabek before he sold his cut in 1990 as documented in The Sporting News which quoted Jerebek as saying, “Darvick asked me what I thought it was worth and I told him at least $1,500 to $2,000. When he went back to the owner, however, the guy told him to put it up for auction.” Madden said in his article that Darvick’s Jackson cut was “obtained by a collector from a relative of Jackson” but Hauls of Shame’s interviews with Jackson family members and Joe Anders, a family friend who was given the signed cache of legal and financial documents from the family, show otherwise. No Jackson family member we could locate ever sold a cut signature to a collector. Interestingly enough, Darvick never mentioned anything about the provenance of his alleged Jackson cut in his auction catalog and when we sent Darvick emails asking him to reveal the source of his Jackson cut signature he did not respond. Jackson signed this letter along with the 1917 White Sox requesting their World Series money from August Herrmann and Ban Johnson. The unquestionably authentic document was discovered in the HOF's August Herrmann Papers Collection. 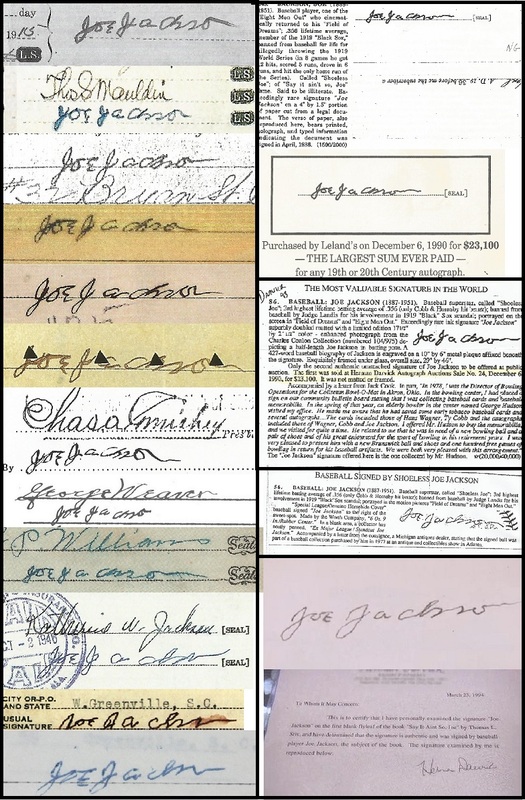 Jackson's signature (inset in red) shows less spacing between letters when compared to most of the financial documents he signed during the same era. “Shoeless” Joe appears to have had difficulty signing his name regularly during his lifetime and its well-documented he avoided putting pen to paper whenever he could, thus delegating signing duties to his wife Katie. The verifiable authentic signatures attributed to Jackson on legal documents and contracts (illustrated in this article) are the only examples we can be confident are authentic. We’ll never be as sure about the other alleged signatures on baseballs and other mediums like photographs, even if they come with a PSA or JSA certificate of authenticity. 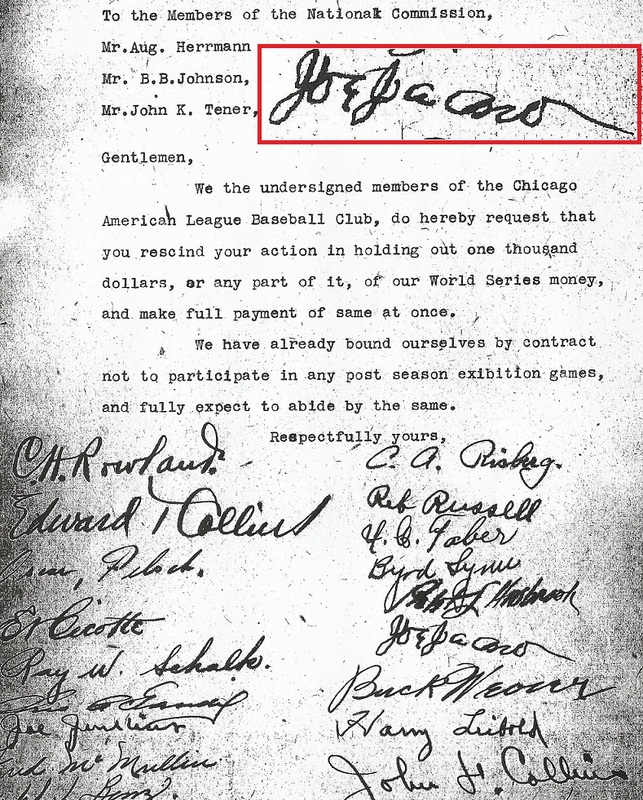 At best, even with strong provenance, some experts will always consider these Jackson signatures “unauthenticatible.” One signed item, however, that is unquestionably authentic and signed by Jackson in the presence of his White Sox teammates is a 1917 team-signed letter to American League President Ban Johnson. The letter was signed by Jackson and every player requesting their share of the World Series receipts for their victory over John J. McGraw’s Giants. The document had remained hidden in the files of the National Baseball Library’s August Herrmann Papers Collection until Hauls of Shame uncovered it a few years ago while researching stolen documents from the same collection. The document is the most clear and convincing evidence that Jackson could and did sign his name along with his teammates on items that did not required a signature in conjunction with a financial transaction. Alleged partial and full samples of Jackson's signature were found on an envelope said to have originated from the Jackson family. Those samples were sliced into three different examples which were encapsulated in graded holders by PSA/DNA. Another fragment signed just "Joe" was offered in SCD in 1999 (bottom). Aside from the iron-clad signatures on the legal and financial documents originating from Jackson’s family and friends, other more dubious examples have surfaced for sale in the auction marketplace. When the authentic- signed Jackson documents surfaced in the early 1990s there were several other signatures and fragments of signatures that were alleged to have Jackson family provenance as well. Three such signatures were found on the back of an envelope and another just signed “Joe” was said to have originated from a small note pad that once belonged to Jackson. The three examples of writing included on the envelope were originally sold in 1997 by Mastro & Steinbach Auctions as originating “directly from the Joe Jackson estate” and years later the envelope was cut into three pieces which were ultimately encapsulated and authenticated in three separate PSA/DNA holders. The “Jo” example was paired with a partial Pete Rose signature (“Pete”) in a PSA holder. The “Joe” partial notebook signature was offered in SCD by Frank Foremny in 1999. In addition to the cut signatures manufactured from the one envelope (which are considered by most experts as genuine) both PSA/DNA and JSA authenticated another alleged Jackson cut that was purchased by the Leaf Trading Card Company and inserted into a 2010 Joe Jackson relic card. The card ended up selling at Heritage Auction Galleries in 2011 for $26,290 with LOA’s from b0th JSA and PSA/DNA. In their promotional materials, Leaf estimated that the value of the alleged autograph was between $70,000 and $100,000. This alleged Jackson signature has been identified as a forgery by several experts we interviewed. Another alleged Jackson signature was sold publicly for $72,000 at Legendary Auctions in August of 2010 with an LOA (and Grade of 9) from PSA/DNA and Steve Grad. The alleged Jackson pencil signature was signed on a page from an autograph album that Legendary stated, “Has changed ownership a couple of times since its origin in the ’40’s” allthough it was originally acquired by a young girl from Greenville, SC., in that era. The woman, Sarah Taft, allegedly had Jackson sign the album but none of the other pages in the volume are signed except for one by her father Eddie Taft. Alleged cut signatures of Jackson were included in a 2010 Leaf relic card and a 2013 Legendary Auction with LOA's from JSA and PSA/DNA. Experts who examined both of these signatures, however, are of the opinion they are forgeries when compared to genuine examples of Jackson's signature from his 1915 Draft Card (bottom left) and a 1946 mortgage note (bottom right). The AP featured an alleged Jackson photo authenticated by PSA/DNA and currently for sale at Heritage. Another Jackson photo sold at Sotheby's in 1999 for $43,000 (right). In our next report on Jackson’s handwriting we’ll examine the photographs alleged to have been signed by Jackson. In particular, we will focus on the PSA/DNA authenticated photo appearing in Heritage’s Platinum Night Auction later this month and compare it with another Jackson signed photograph sold at Sotheby’s in 1999 for $43,000. Josh Evans, a true Legend in His Own Mind; somehow he has avoided the legal troubles the hobby’s fall guy Bill Mastro has gotten himself into……He (Evans) has more lives than Hyman Roth. I give him credit though, he is certainly no dummy, passing off his bad “stuff” (a Josh word) on the naive Mr. Halper. Josh, hope you get well real soon……. Everybody trying to make a buck. How many people in the HOS articles should be Mastro’d? Interesting to note that the AP report and other press coverage of the Heritage Shoeless Joe photo makes no mention of the other Shoeless Joe Jackson photo that sold at Sotheby’s Halper sale in 1999 for $43k. That photo was authenticated by Heritage’s current consignment director Mike Gutierrez who has worked for PSA/DNA and is currently listed as a JSA expert on Spence’s website. Virtually every big dealer have been shown to be a fraud and every big piece has been shown to be fake and no one calls out anyone until they’ve made their money. How come everyone was so brave only after Halper died? People “knew” Mastro trimmed that Wagner card for years/decades, but everyone kept their mouths shut? I guess if you call out a fraudster, you won’t be able to sell him anything. Good job everyone. SCD shined Halper’s shoes, washed his car, washed his drawers and put on red lipstick and a wig and walked tall with Halper. Nobody questioned good ole Bare and they cheered the Mastro auction results. Kinda reminds me of Bonds,Canseco,McGuire til reality unfolded of which most played deaf-dumb-blind for years. I could not agree more with several comments made above. Sports Collector’s Digest let a lot of collectors down out of pure greed. It gave us insightful articles by Ron Keurajian, but it also gave it also gave birth to Coach’s Corner Sports Auctions. That periodical really was the Bud Selig of it’s time. In mentioning Coach’s Corner, they have a “nice” Joe Jackson single in their current auction, and they have hired a new authenticator. Barry Halper certs are starting to come into the market and myccsa.com has over fifty baseballs certified by Halper. A thread on Net54 breaks down the latest Coach’s Scam as I guess the prices with RareandSigned.com certs weren’t pleasing the consignor. GREAT article. But it does bring up the question, WHO can you trust when it comes to valid authentication of autographs? This problem certainly effects the hobby as a whole. The entire industry should be investigated (by the FBI) and procedures should be put in play. Fifty Shades of Operation Bullpen I can’t wait for the movie. Wake up fellow collectors! I think the fact the coach in his corner hasn’t been eliminated speaks volumes of what is looming down the road from a federal level. It is out of control. Halper certs…..do they come with a drawing in the corner of Bare and a smirk? I thought SGC might be a good alternative to the clowns at PSA and JSA, but Darvick is on the staff there. Why isnt Ron Keurajian opening his own authentication company? We need it, forgeries in the big auctions are at an all time high.